I love me some White Star. You can play it as space opera, hard scifi, mash it up with fantasy - it all works. What it lacks is setting. Sure, there are some settings for White Star, but +Pete Spahn knows sandboxes, settings and adventures. Heart of Varrul is a White Star: Science Fiction Roleplaying™ campaign setting book that details the aliens, factions, and conflicts of the Rul System, Tathkee Station, and the Planet Varrul. The Rul System is on the brink of an interstellar gold rush and the PCs are poised to get involved on the ground floor. How they get involved is up to them! 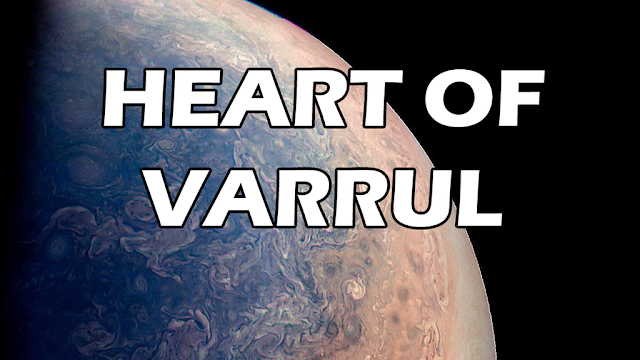 Written by Peter C. Spahn and James M. Spahn, Heart of Varrul expands on the foundation laid by the critically acclaimed White Star: Science Fiction Roleplaying™. With illustrations by longtime White Star™ artist James Shields and maps by Just Insert Imagination's Morne Schaap, Heart of Varrul is specifically designed to give Referees a readymade location to run hours of adventures. Pete is an experienced KS project creator and he has always released strong finished projects. 15 bucks gets you the Heart of Varrul and some prior Small Niche Games White Star releases in PDF. 25 bucks gets you the same in PDF plus an at cost coupon for the print version of Heart of Varrul.